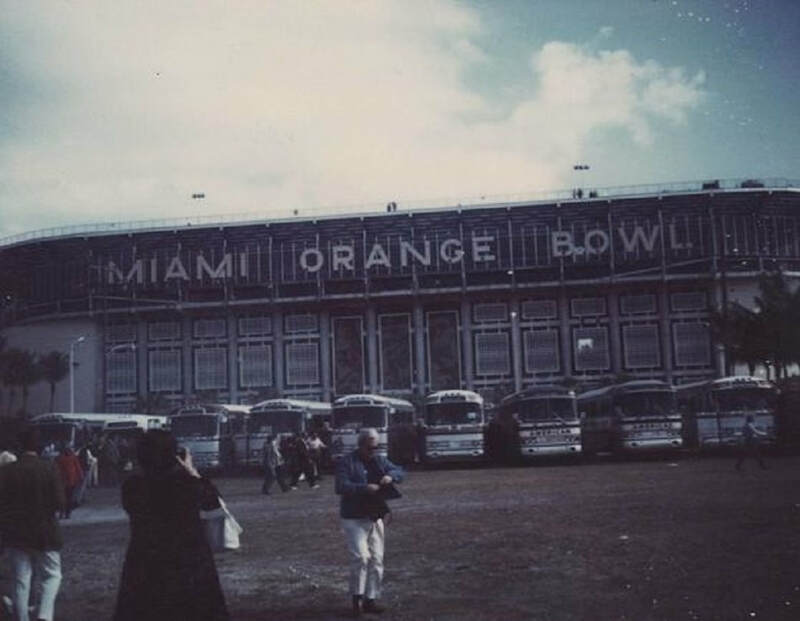 It is probably safe to say the fifth Super Bowl, which returned to the Orange Bowl in Miami, Florida for the third time in five years, was the most mistake-filled Super Sunday of all time. Despite this, the contest came down to the final play of the game, as Colts' kicker, Jim O'Brien, kicked the winning field goal from 32 yards out on the very last play of the game. ​Dallas was nursing a tentative 6-0 lead off the back of two Mike Clark field goals midway through the second period. The Colts finally found the end-zone shortly after when tight end, John McKay, took a tipped pass 75 yards for the contest's first touchdown. However, Jim O'Brien would have his kick blocked, leaving the score locked at six. When dazzling Dallas running back, Duane Thomas, sprinted over the line, with Clark booting over the extra point, the underdog Cowboys had a seven-point lead 13-6 at the half. 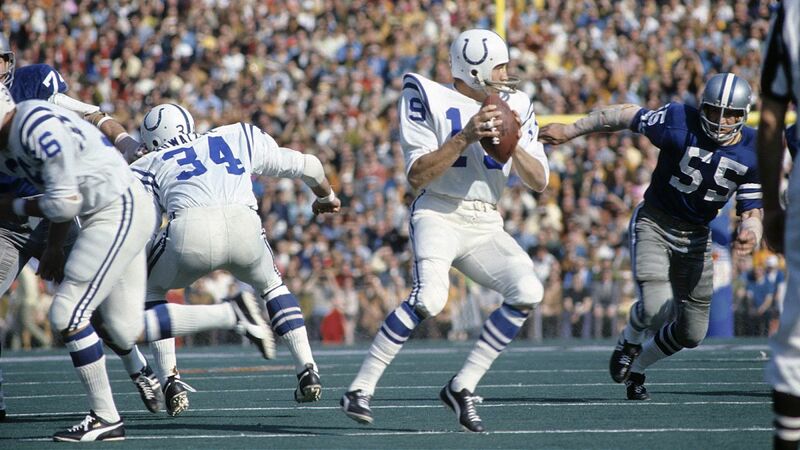 Worse still for the Colts, their legendary field general, Johnny Unitas, had been knocked from the game and was replaced by Earl Morrall. Unitas would not return. A scoreless third period, as well as a key interception by Cowboys' linebacker (and eventual MVP), Chuck Howley, in the opening moments of the final period, left the Colts still trailing by a touchdown with time beginning to grow short. In what Morrall would later refer to as "the play of the game", as Dallas looked to embark on a clock-killing drive late in the fourth quarter, Colts safety, Rick Volk, picked off the Cowboys' Craig Morton and returned the ball to the 3-yard line. Just two plays later, Tom Nowatzke was picking himself up from the blue turf of the end zone. Once Jim O'Brien secured the extra point, the game was tied again, 13-13. Each team then exchanged punts until Dallas began a drive 2 yards into Colts' territory with less than two minutes remaining in the game. From there, the Cowboys began to self-destruct. Penalties pushed them back deep into their own territory before an interception of Craig Morton's tipped pass was secured in the arms of linebacker, Mike Curtis, who then rumbled to the Dallas 28-yard line. 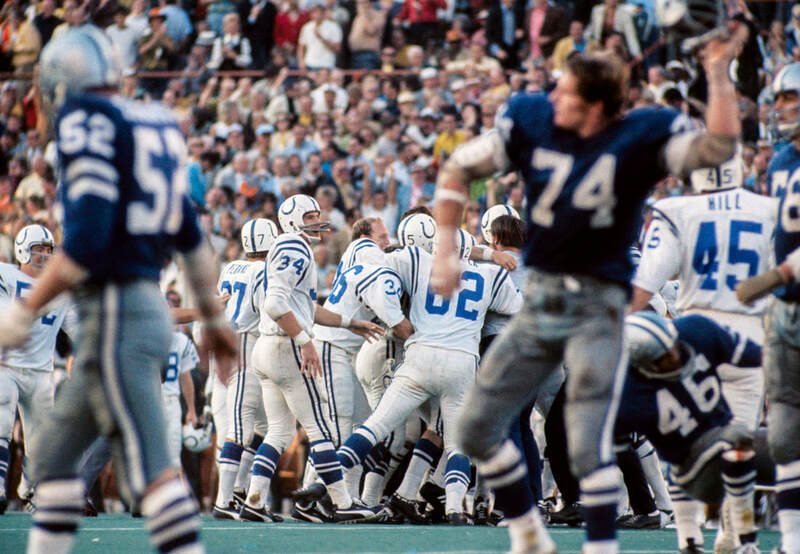 Two plays later, Colts' kicker Jim O'Brien trotted onto the field, his helmet strap hanging unfastened from his helmet, and prepared to kick the first game-winning field goal in Super Bowl history. The 32-yard kick split the uprights perfectly with five seconds remaining in the contest. Dallas would get the ball with time for one last play, but Morton's last-ditch attempt was intercepted by Baltimore's Jerry Volk sealing the victory, 16-13. Jim O'Brien boots through the winning field goal as time expired. Halftime Show: South Missouri State College Marching Band. Dallas Cowboys' linebacker, Chuck Howley, is the only Super Bowl MVP in history to be on the losing side. 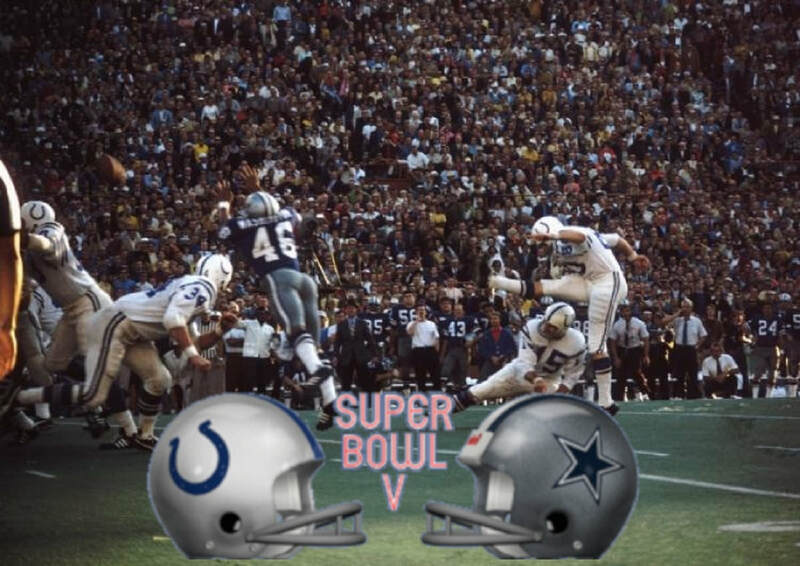 Super Bowl V was the first big Super Sunday game to be played under the new AFL-NFL merger, with the Baltimore Colts having moved to the now renamed AFC and being the first official AFC Super Bowl representative. Each team entered the game with demons to exorcise (something which arguably showed itself in the erratic tone of the contest). The Colts were steel reeling somewhat from their emotionally crushing defeat at the hands of the New York Jets in the same stadium in Super Bowl III, while the Cowboys had built a reputation as being "next year's team" following successive losses in the NFL playoffs since the mid-1960s. Whether it had any effect on the Cowboys' mindset or not is not known, but under rigid league rules at the time, due to Dallas being the designated home team for the fifth Super Bowl, they were "forced" to wear their dark blue jerseys (now designated home teams can choose their dark or light jerseys). 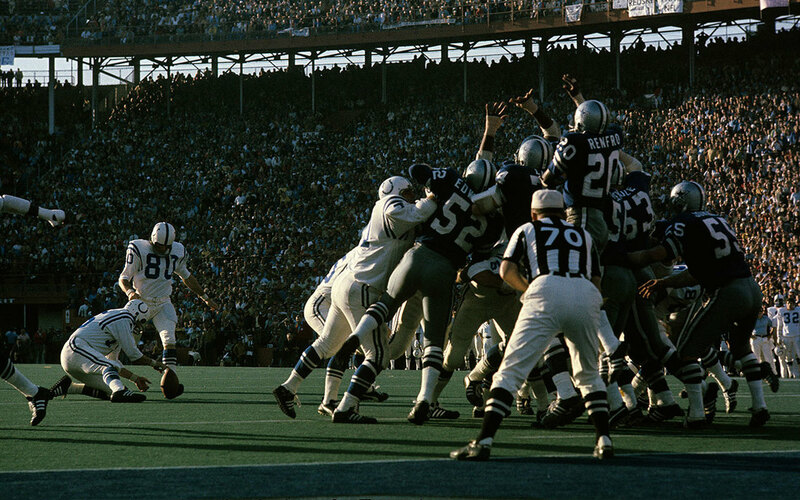 Super Bowl V was also the earliest starting contest in Super Bowl history. Kickoff was 2 pm Eastern time, which also meant that the kick-off was in the morning for those watching on the Pacific coast. Super Bowl V was the only Super Bowl where the MVP was on the losing side. Dallas Cowboys' linebacker, Chuck Howley, bagged the award for one of the few positive contributions from either side. Howley's two interceptions were also a Super Bowl record. There were several other notable Super Bowl records set in Super Bowl V, including the longest touchdown pass (75 yards from Unitas to Mackey), while Craig Morton's three interceptions were the most in a Super Bowl. Incidentally, Earl Morrall also put himself in the record books, as his interception gave him a total of four interceptions in Super Bowl history. As a team, the Cowboys would also claim a Super Bowl record as they netted ten penalties for a total of 133 yards.